June 13th marked the opening of the Community Aldeia. Participants have travelled from as far as Madagascar, China, and the Solomon Islands for ten days of sharing experiences, learning from one another, and presenting their work on the international stage. The highlights of the Aldeia will be thematic panel discussions featuring Equator Prize winners, focusing on issues such as agriculture and food security, adapting to climate change, and sustainable fishing. The first presentation, given by Eileen De Ravin, outlined the concept and goals of the Equator Initative. The Equator Initative works to intentify and shine a spotlight on community-based success and achievement. It has awarded over 1.5 million USD to 127 groups, preserving biodiversity and working towards poverty reduction. It does this both through the Prize and throught the community diaglogues that form an itegral networking and knowlege-sharing component of the Prize. The second presentation, given by Alejandra Pero, explained the concept of a community dialogue. Dialogues are a forum, designed to celebrate the Equator Prize winning communities' achievements, to share winners' experiences with one another, to provide training and workshops in different areas, and to interface directly with global and national policy makers. They take place globally, and are pegged to large international UN or civil society conferences. 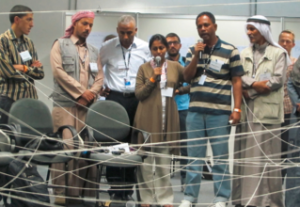 Participants attend a large scale international policy forum, gain access to policy makers, participate in meetings organized by other civil society groups, and share their experiences and practices with a diverse audience. The third presentation, given by Whitney Wilding, outlined the selection proccess by which the Equator Prize winners were selected. 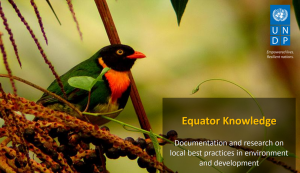 The Equator Prize 2012 was awarded to initiatives that are working to advance sustainable development solutions for people, nature and resilient communities. The twenty-five winners were selected from 812 nominations, received in thirteen languages from 113 countries world-wide. Each has faced their unique challenges by developing solutions suited to their respective landscapes, cultures and climates, including bio-diversity conservation, marine and coastal management, energy access and more; what they share in common is a testimony to the power of local action for transformative change. The final presentation of the day was entitled Equator Knowledge, presented by Oliver Hughes. Mr. Hughes spoke of the different outputs of the Equator Initiative, each of which represent a different facet of of the information, or knoledge, aquired by the Initiative. Specifically, he spoke of the Profile Pages, Case Studies, and "The Power of Local Action". Profile Pages are short profiles of all winners over the 10 year history of the Initative, available on this website, Case Studies are more detailed documents overviewing the biodiversity, socioeconomic, and policy impacts of each group, as well as providing a larger context for the work. 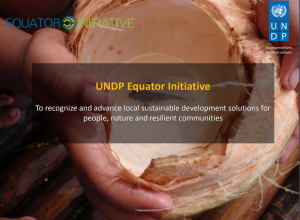 "The Power of Local Action" is a document produced by the Equator Initiative that summarizes all contributions made by the winners to the goal of Sustainable Development.